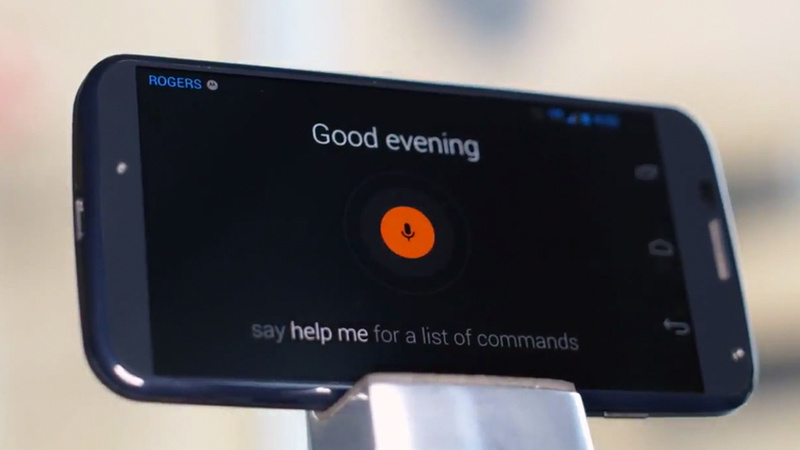 In the leaked video (embedded below) the Google representative even says that the phone “learns” your voice as you talk to it which suggests some fairly high-end voice command technology. Along with the voice commands, the video also revealed some of the other features present in the Moto X such as Active Updates. Active Updates will quickly show a symbol for an update instead of “just a blinking light” so that users will know what the update is actually signifying. The Moto X will also allows users to take pictures by clicking anywhere on the screen as well as take consecutive shots by clicking on the screen multiple times. This photo feature will be activated with a wrist gesture which includes two quick wrist swivels which could either be very useful or a pain if the accelerometer thinks other motions are wrist swivels. While we are first hearing about some of these new features such as the always-on voice commands with the Moto X, it could very well be a new Android feature which will be incorporated into other devices with the next Android update. The Moto X will be the first Motorola smartphone to come out since Google completely took over the company, which means there are very high expectations for the device. According to the video, Rogers will be getting the phone in August and it will be available through other carriers before the end of the Summer in both a black and white version.